How are Pakistani leaders and society responding to the worst-ever mass-casualty terrorist attack on school children in Pakistan since 911? Will Pakistani political leaders finally come together to fight the Taliban menace? How will the government and the society at large deal with terrorist sympathizers and apologists present in all walks of life in society? Will the Pakistani media continue to offer a platform to the apologists and sympathizers of terrorists to rationalize murders of innocent civilians, including women and children? 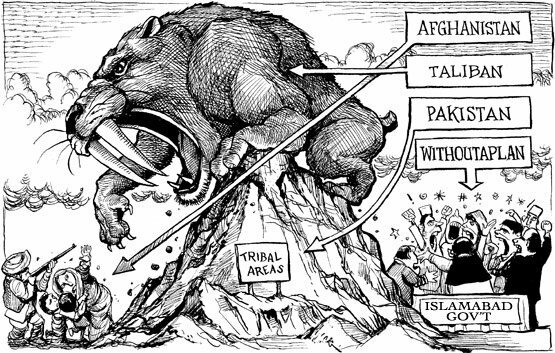 Will Pakistanis finally own this war against the Taliban as their own war? Pakistan's Political, Military Policy Actions in Response to Peshawar Tragedy from WBT TV on Vimeo. What is Nawaz Sharif's Counter-terror strategy? Islam should be separate from politics. That's when things will start improving. Western world realised it much before and that's why they never allow region or religious leaders to dictate any policy decisions. Today so many muslims want to migrate and live in western countries because of secular constitution this guarantees equality for men and women alike also laws although not sharia or church teaching based still don't discriminate based on religion. This section provides a summary of the main theories of the press and its ethics, from the 17th century onward. A drum transmitter used by Reuters to send b&w and color news photos before the use of digital photography. Photo courtesy John Schults. In an influential text from the 1950s, Four Theories of the Press, the authors outlined a number of “theories of press” since the 17th century. 1. Authoritarian theory of the press: The function of the press is to support the policies and actions of the state, and its authorities. The press should foster social solidarity and national unity. The state has the right to control the press for the overall public good. In many cases, controlling the press means preventing the press from embarrassing the existing government, to repress criticism and protest, and to severely restrict press freedom. The authoritarian view was prevalent in 17th century Europe where publishing came under the prerogative and censorship powers of the monarch and church. The authoritarian theory is embraced today by many leaders of non-democratic states. 2. Libertarian (or liberal) theory of the press: The function of the press is to protect the people’s liberties and rights, and to inform the public so they can participate as citizens in democratic self-government. The liberal theory prefers a privately owned news media that is maximally free to inform citizens and criticize public policy, as well as act as a watchdog on authorities. The right to publish and express oneself freely is not a prerogative of the state or a government. It is a fundamental right of free individuals. The liberal theory argues that a free marketplace of ideas, while it may cause harm over the short term, is the best safeguard in the long run for a free and liberal society. 3. The social responsibility theory: The social responsibility theory: Four Theories describes social responsibility theory as a 20th century development and critique of libertarian theory. It attempts to balance the liberal stress on the freedom of the press. It argues that such freedoms of a powerful news media must be balanced by social responsibilities. Journalists have a duty to provide well-contextualized news in a comprehensive manner. They have a duty to provide a diverse forum of views and values. They have a duty to go beyond entertaining news consumers and to provide a core of in-depth analysis on the most serious issues. Over the past year, the TTP has been reduced to a shell of its former self. Founded in December 2007, it was once a formidable umbrella organization uniting scores of Taliban-style groups across Pakistan’s border regions with Afghan jihadis in a war against the Pakistani state. By the spring of 2009, the TTP controlled most of the country’s northwest, holding territory just 60 miles from Islamabad. While two major Pakistani army operations in 2009 managed to repel them from the capital, the TTP proved resilient, thanks in part to the safe havens it had carved out in Pakistan’s North Waziristan tribal area and in parts of Afghanistan. But last November, the tide against TTP began to turn once again, when a CIA drone attack in North Waziristan killed its second leader, Hakimullah Mehsud. His successor, Fazlullah, failed to assert control of the group — in part because he wasn’t a member of the Mehsud tribe, which spawned the TTP’s first two leaders. In February, ground operations seemed imminent. Instead, the prime minister announced before parliament that the government would begin talks with the TTP. But those deliberations soon reached an impasse and an impatient army decided to begin its military campaign. Terrorist attacks in Pakistan rose, as did divisions within the TTP. Retired Pakistani generals clamored for operations on news talk shows. In private, the army chief pressed the prime minister to approve ground operations. Ultimately, the military got its way, beginning an air campaign in late winter 2013 that expanded in the spring and forced a reluctant civilian government into launching ground operations against the TTP and other groups in North Waziristan in June. These operations achieved a major tactical victory: They severely weakened the TTP terror machine by denying it the space tooperate. Prior to the Peshawar attack, Pakistan was on pace to have its fewest number of terrorism casualties since 2007.Prior to the Peshawar attack, Pakistan was on pace to have its fewest number of terrorism casualties since 2007. In the process, Pakistan broke the back of the TTP. As the military moved deeper into North Waziristan, the TTP’s internal fissures grew. Umar Khalid Khorasani, an Afghanistan-based leader of the TTP’s Mohmand tribal agency chapter, established a splinter group, the Tehrik-i-Taliban–Jamaat-ul Ahrar (TTP-JA). The Pakistani army and air force kept up their campaign, continuing to hit the TTP and TTP-JA hard through the summer and into the fall. And in recent weeks, the United States has conducted rare drone strikes against TTP and TTP-JA targets inside Afghanistan. Like a bloodied, weakened beast, the TTP lashed out viciously on Tuesday. In attacking the school, the TTP chose the softest targets in a military cantonment. Some, though not all, of the children came from military families. And so the TTP — indifferent to the blood of thousands of innocents on its own hands — has anointed itself as the avenger of its own collateral damage suffered at the hands of the Pakistani army. Pakistan is to establish military courts to hear terrorism-related cases in the wake of a massacre at a school. Prime Minister Nawaz Sharif said the move would help ensure "terrorists pay the price" for their "heinous acts". Last week, Taliban fighters attacked an army-run school in Peshawar, killing 152 people, including 133 children. Pakistan's political parties reached agreement on the new courts after meeting to discuss a national plan of action to tackle terrorism. Mr Sharif hosted talks at which most of Pakistan's mainstream political parties were represented. Speaking after the meeting, he gave few details about the military courts but said the deal marked an historic achievement for Pakistan. Earlier, he said the country was in an "extraordinary situation" that needed "extraordinary actions," adding: "This nation and history will not forgive us if we don't do anything now." He said Pakistan's politicians "should not wait for another tragedy to strike before we finally wake up". Other measures agreed were reported to include a crackdown on hate speech and the funding of terrorist organisations.